Signs Everywhere in response to a report titled: Any Rutting Activity? 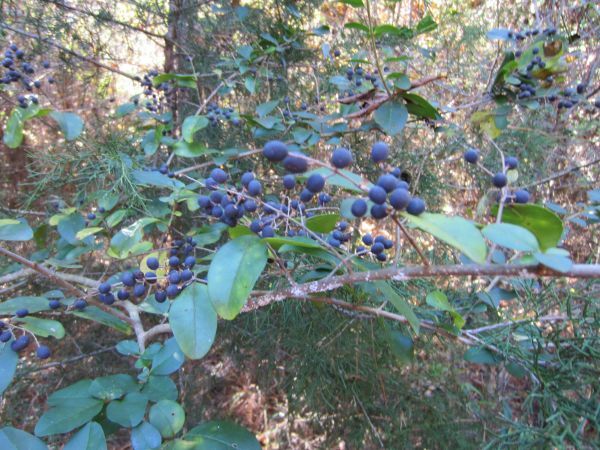 Every one of these on our property is bare of the purple berries from the bottom to where the deer can reach. The tops are still full off berries. Does anyone use a 7mm-08, is it a good rifle for a 10 year old to shoot? I was looking to buy her a .243 but a friend is offering me a H&R 7mm-08 at a great price. I get asked 'How can you shoot that?' when my friends wife sees this picture. I know there are antler restrictions (this is in zone 1) but is there any room to shoot this buck? May need to bring the kids hunting? A comment titled: Signs Everywhere in response to a report titled: Any Rutting Activity? They are so perfectly nocturnal though! There were 3 territorial scrapes on the roads of our property, and I came across 2 breeding scrapes on the interior trails. They just don't visit any of them during the daytime, or at least not when I'm around. I though I would bust one freshening a scrape up today after all the rain last night, but he passed before daylight to paw it up again. A comment titled: Wolf? in response to a report titled: Wolf? Sure does look too big for a coyote. The recoil was really my concern, but you explained that well so I think I will go with the 7mm-08 for my kids. It is a Handi Rifle crack barrel single shot with a transfer bar under the hammer as the safety. The little gun is exactly what I hunt with now except for the caliber. I actually have gotten to the point that I use my .444 handi rifle all season instead of just during primitive since it is such a compact, reliable gun and can make every shot I need. I have also never had to blood trail a deer since the first day I started using that gun. The only negative I can come up with is you can't follow up a shot quickly, but I have never had to. I hunted with my daughter from the Saturday before Thanksgiving up through Thanksgiving day without seeing anything which I thought was impossible on our property. I was so discouraged I was thinking we need a whole new management plan for the property. Then Friday once that front came in we saw deer galore from the Friday afternoon hunt through the Sunday morning hunt. No buck as usual, but plenty of meat. When we have to use protein it turns into dog food... We had to move the protein to a drum feeder with a gravity tube instead of a spin feeder to minimize the dogs. When we put out corn it turns into a pig and raccoon feast so we had to elevate the covered trough feeders to rule out the pigs. When we used to use the spin feeders with pellets you have to put less in the feeder and let it flow. If you try to make it last the moisture gets it every time. 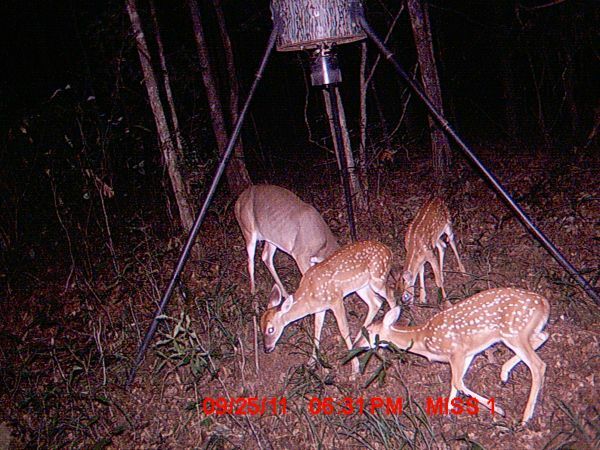 When Mississippi lets you feed both we would mix corn and pellets in the feeder and we could make it take longer to empty. If the feed is just piling up on the ground you may want to move the feed to the deer and stop trying to bring the deer to the feed? 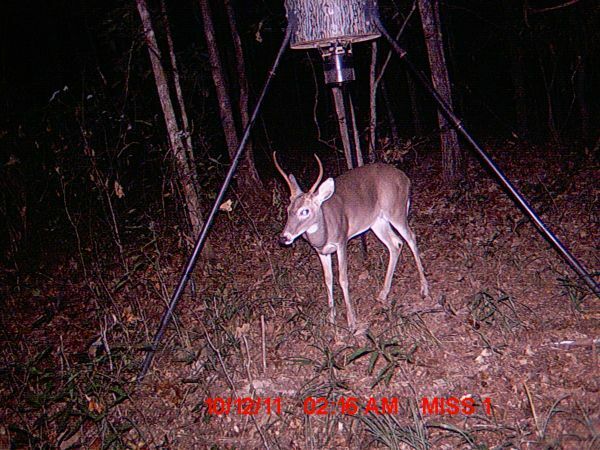 What kind of pictures of deer are you getting on your camera? We rarely get pics of mature bucks at our feeders, but we have does at them almost every day or every other day at worst. A comment titled: Bucks in response to a report titled: Cull Bucks??? 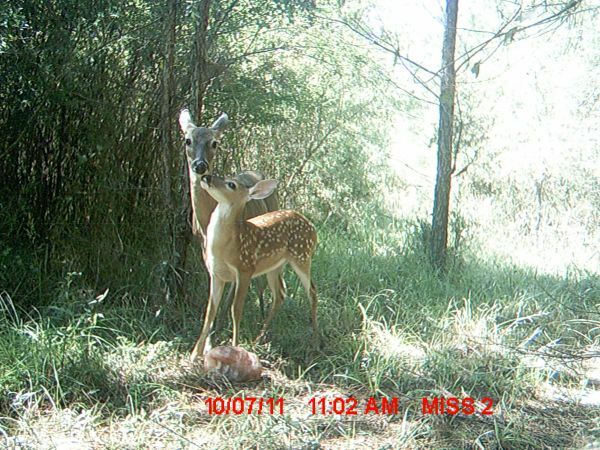 Heck, they have plenty of fawns so the bucks have to be somewhere. We are more of meat hunters, but at the same time we are going to plant and feed year round to try and grow a wall hanger or two. I don't know how much our little piece of property is going to help, but we sure will try. We are just outside of Tallahala WMA in Bienville NF. It is obvious there are plenty of deer. Hunting Montrose, MS on land my father purchased 10/2011. Small property with lots of dear, just very few mature bucks, lots of spike bucks.